The Sacred Valley of the Incas | So Many Exciting and Beautiful Places! We actually had a couple of days at home before heading out again, south this time, for a South American cruise with Crystal, preceded by a visit to Machu Picchu in Peru. There was barely time to unpack, do laundry, and repack. This time, we had to prepare for three different climates, warm, cool, and cold, including a flight to Antarctica (we hope.) Down jackets, sorrel boots, fleece lined jeans, heavy gloves, hats, socks, etc. took one whole suitcase by themselves. For the Machu Picchu trip, we had to pack carry on bags for three days, while leaving all other luggage in storage. Holy cow! Fortunately, I’m pretty good at solving puzzles, even when pressed for time. We left Minneapolis around 11:30 am, connecting through Atlanta, and arriving in Lima at 12:30 am the next day. Unknown to us, our cruise line had arranged transportation to the hotel. When we booked the cruise, we were informed that the cruise line would arrange transfers for people coming in on the 5th, so we believed we had to arrange our own. We took a cab, got to the hotel around 2:00 am, and fell into bed. The next day, we learned that there were several others passengers on our flight who didn’t get to the hotel until 3:30 because the cruise line personnel were trying to find us. Poor communication. Even our travel agent thought we were on our own. We had breakfast, then noticed that there was a reception desk in the lobby for Crystal, so we got more information about what to expect for the next few days, then went back to our rooms to reorganize our bags. Looking out the window, I wasn’t sure if it was fog or smog that I was seeing. 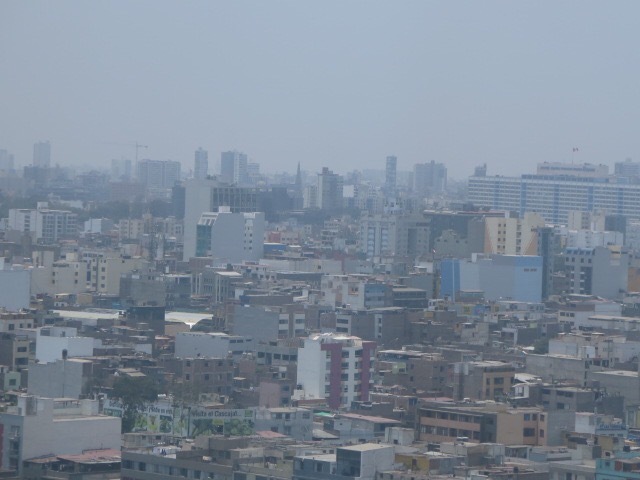 Checked the air quality numbers for Lima, and it was indeed smog. In spite of the smog and high humidity, we did go out for a walk in the afternoon, just to see what the area looked like. 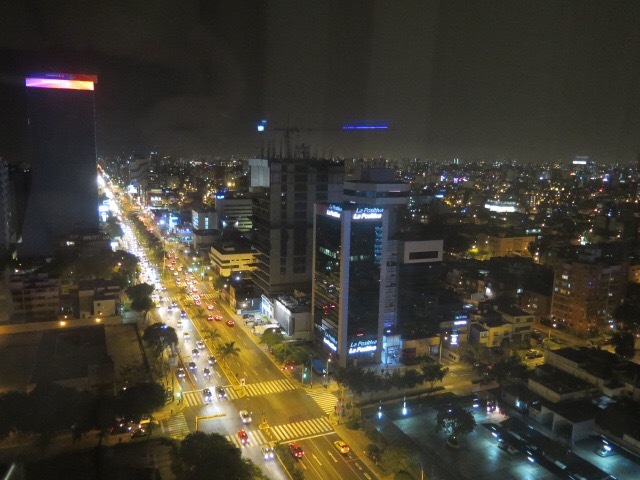 We were staying at the Westin Conference Center in San Isidro, which is the financial, cultural and shopping center of Lima (no shopping on Sunday, though.) There was a lot of traffic, and it seems to be a requirement that all cars honk at least once every other block. Up at 5:00 am so we could have breakfast before leaving the hotel at 6:15. 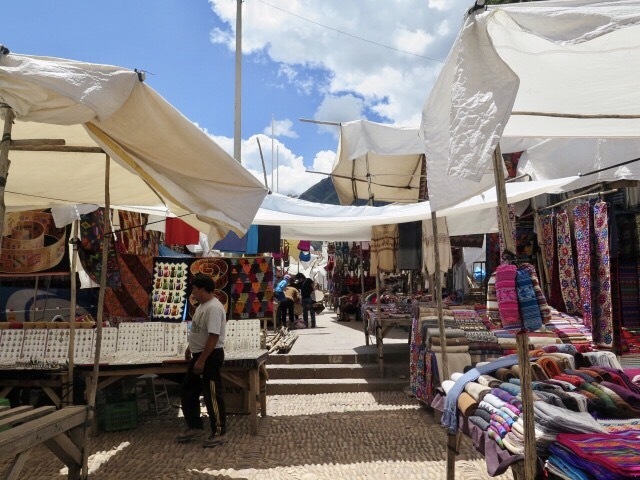 We flew to Cusco, arriving there around 11:00 am, then boarded a bus headed for Pisac Market, an opportunity to drop some Sols (about 3.25/US dollar) in Peru. 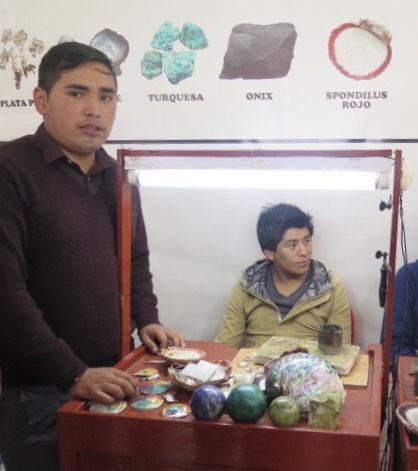 While there, we visited a silver smith who explained to us how we could tell the difference between quality silver and that often sold in the markets. The primary difference is the amount of copper used in the silver – the higher the percentage of copper the more yellowish the silver will appear. Ideally, silver should have only about 5%, then it will have a white cast rather than yellow. Also, he talked about how to tell whether the alpaca wool was authentic. Look for a slightly oily feel, plus the initial itchiness (or perpetual itchiness in my case.) Synthetics don’t have that, and will feel more spongy. The first shearing of an alpaca results in a very fine, soft wool that feels almost like cashmere, and is, of course much more expensive. I did my part to help the economy, purchasing a beautiful silver necklace, inlaid with stones to create a hummingbird feeding on flowers. It was necessary to also purchase the matching earrings and bracelet. BTW, the silver was very white. No more shopping for me! At least not today. We stopped in the town of Urubamba for lunch at Tambo del Inka Hotel, a gorgeous hotel in the Sacred Valley of the Incas, so called for its fertility. The Urubamba River flows through the valley on its way to the Amazon. Rain water washes lime and nutrients from the surrounding mountains into the rivers that flow through it, which then enrich the surrounding lands when they flood. 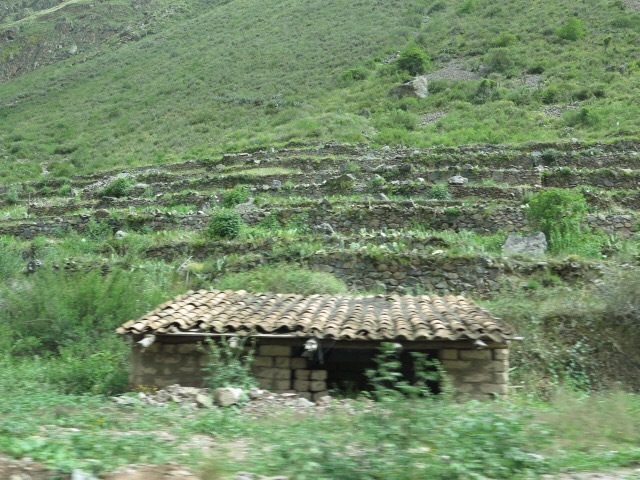 Agriculture is one of Peru’s main industries, after mining (salt, copper, gold and silver) and tourism. 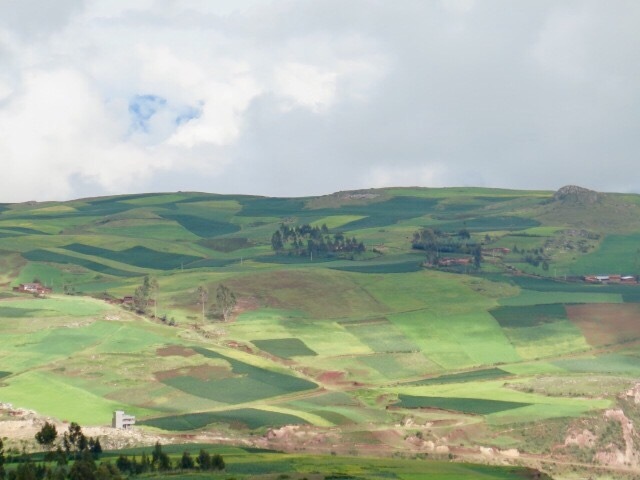 Peruvian farmers grow 3,700 varieties of potato, along with quinoa, corn, fava beans, barley, Tariq (lupine – the beans are edible), mustard, and other vegetables. 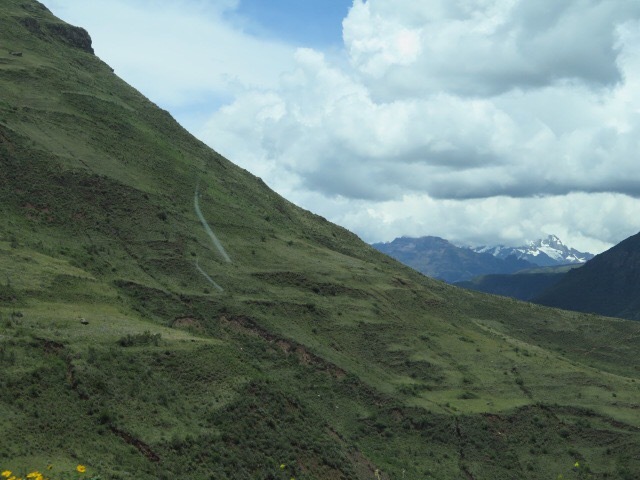 This agricultural fertility was exploited by the Incas who maximized the potential by terracing the surrounding mountains, creating more farming land and controlling erosion. Many of these terraces are still being used today in farming. 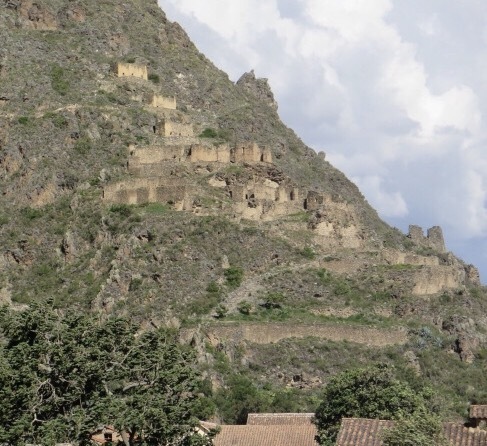 After lunch, we proceeded to the Ollantaytambo Archaeological Site, which sits at the confluence of three valleys, one leading to the jungle, one to the ocean and one to the Sacred Valley. 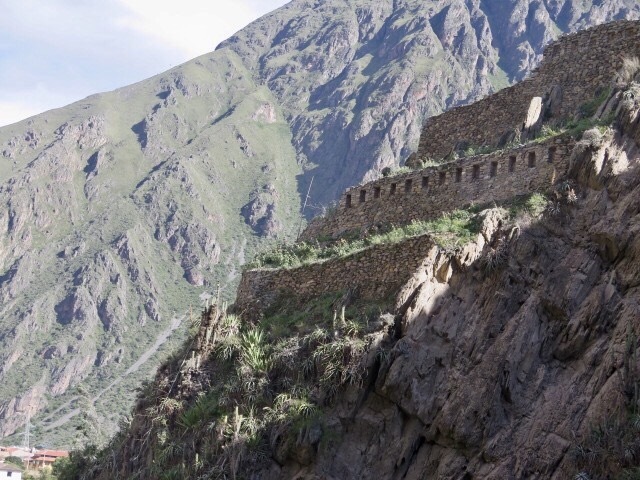 As such, it may have served as a major trading site for the Incas. Vegetables from the Sacred Valley were traded for coca leaves from the jungle. The coca leaves were valued as an analgesic and as a stimulant. They are still used today to help laborers put in the long days that are required in agriculture. Coca leaves are used in a tea that helps alleviate the effects of altitude sickness. I drank a couple cups each morning, and did not experience the normal headaches until very late in the day. 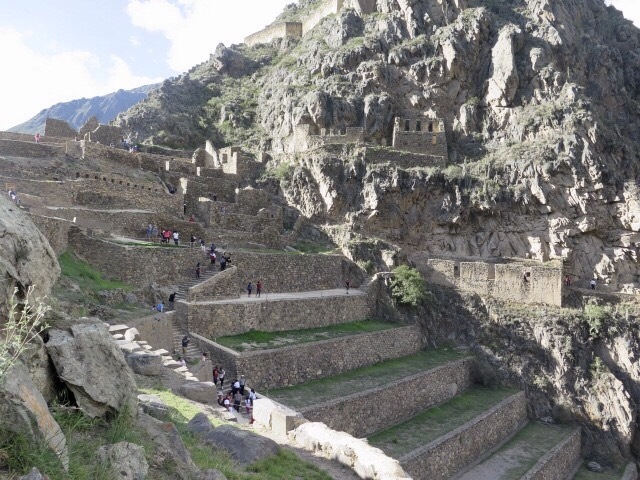 Ollantaytambo covers over two square miles, and includes farming terraces, storage buildings, residences, and lookout areas. 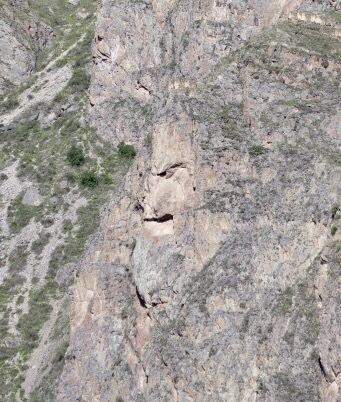 There is a formation on one of the cliffs that some say represents Tunupa, a pilgrim preacher of knowledge. It was long thought to be completely natural, but recent searchers have found ancient carving tools at the site. 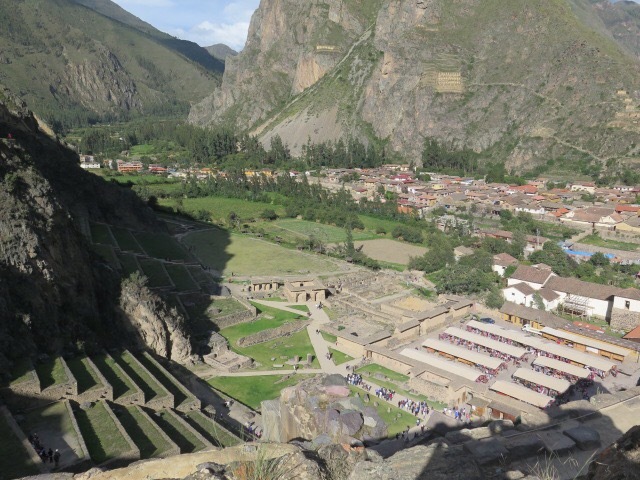 Our guide, Oscar, talked about how the Incas built these huge edifices, using only human labor. The Inca paid taxes through physical labor, several months each year. Thus, there was a never ending supply of labor. The enormous granite blocks, some as large as 50 tons, may have been brought up the slopes using ropes and ramps. They were skillfully cut at the site, using rocks and probably hand axes. Oscar showed us a hand ax that he found at his mother’s farm only the month before. It was about 5 inches by 3, and quite heavy. 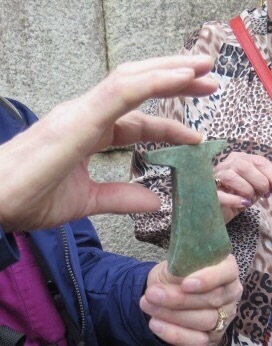 It appeared to be made from bronze and other minerals. The Inca were master builders. The stones were cut in a tongue and groove fashion, with one side of the stone being concave, the side of the adjoining stone being convex. There appears to be no space between the stones, and they form patterns of fairly uniform size and shape. The walls are not perfectly vertical, but lean in toward each other. Not all walls are so beautifully built, some are less aesthetically pleasing. It’s thought that the former were used for more important structures, such as temples or residences of more important persons. Also, about 60% of the wall is underground, providing a strong foundation. Thus, most Inca buildings are able to survive earthquakes. Many buildings in Cusco and surrounding cities are original Inca buildings, at least in part. 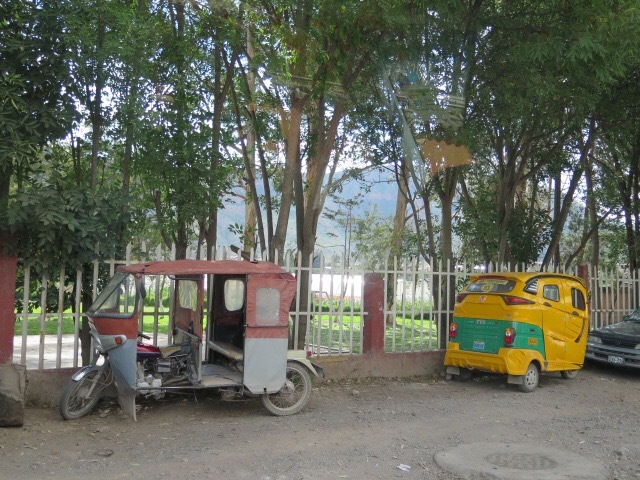 We noticed several three-wheeled automobiles, especially in the smaller towns. These are Mototaxis, and have been in use in Peru since the 1980’s. They are popular because they are inexpensive to purchase and to drive, thus the fares are also inexpensive. According to our guide, they are manufactured in southern Peru, although the first models came from India. They don’t have safety belts, and really look like a glorified tricycle to me. I don’t think I’d want to ride in one on any busy road. 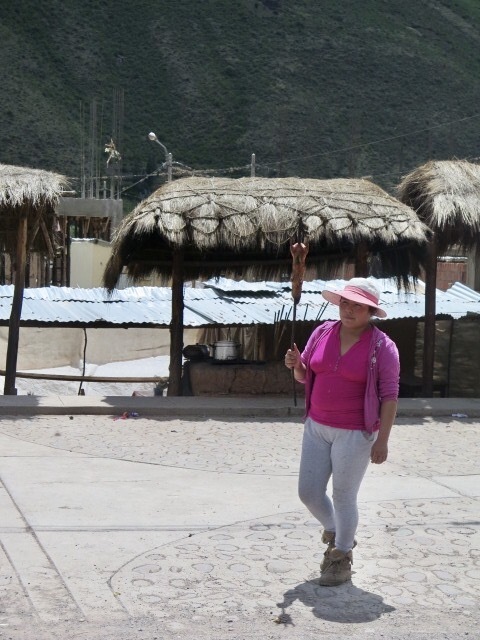 This entry was posted in Crystal Cruises, Peru, South America Travel and tagged Inca. Bookmark the permalink. You are such a natural storyteller. Thanks for sharing your adventures!